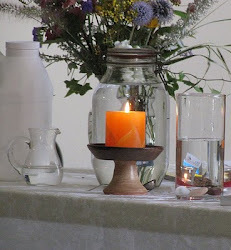 UU A Way Of Life: Unitarian Universalism does not "embrace many different beliefs." Unitarian Universalism does not "embrace many different beliefs." I wonder how successful this campaign was. I have my doubts that it was effective. It is confusing. "Imagine a religion that embraces many different beliefs." I can't. And I don't think, at its core, that's what Unitarian Universalism is. I think the tag line is misleading and people sense this. A more effective approach might have been to promote something like "We support the free and responsible search for truth and meaning and know that there is no certain answer to the question of what is the ultimate reality." or Francis David's statement that we need not think alike to love alike and we have our 7 values, principles, beliefs if you will that we share in common. I am a member of the Brockport Unitarian Universalist Fellowship, an emerging congregation. I promote our 7 principles and our 6 sources. UUs don't just believe whatever they want. We have a covenantal faith which says we will support each other on a spiritual journey and there are many paths to enlightenment. I love our UU faith. It is deep and substantial and we have our agreements with each other to keep the faith around 7 very important and basic things. This idea that a person can just believe anything he/she wants is wrong, inaccurate, misleading, a trick. For example, UUs believe in the inherent worth and dignity of every person. We would not have done well in the anti Semitic times of Nazi Germany and we don't do well in the discriminatory times of Arizona. We don't send people to hell, wish them to hell, exclude them to hell, banish them to hell like many religions do. We don't believe in exclusion and banishment. So we don't "embrace many different beliefs". In fact UUs are different, refreshingly different, with something of great value to offer the world. David, I agree that the term "belief" is overplayed, when all that people ultimately have is opinions. In that context, I'm comfortable with the "many beliefs, one faith" premise, but even that needs some context, doesn't it? As I think we've discussed over the years, I do think that we -- in this freedom-enabled and critically-questing tradition in religion -- share a common faith...or, rather, a distinctive way (a free, responsible, open and ultimately humbled methodology or attitude) in which we approach "the big mysteries" and ultimate concerns of life. I agree with you that our emphasis should not be primarily on the diversity of beliefs (er, opinions) -- not without our "unity premise" also solidly established and emphasized. As Unitarian Daniel Webster once put it..."liberty and union, one and inseparable, now and forever," and to me that's still an essential relationship, not just for governance in general, but as a personal and shared approach to matters of religion as well. Oh, I forgot to change the signature. Sorry...that should have said Ron. To me, in this freedom-enabled and critically-questing tradition in religion -- share a common faith...or, rather, a distinctive way (a free, responsible, open and ultimately humbled methodology or attitude) in which we approach "the big mysteries" and ultimate concerns of life. In our tradition it's that methodology that enables and helps us to develop our richly diverse beliefs/opinions along our personal and shared spiritual and religious life-journeys....not vice versa (not the diversity of beliefs that define the faith). I think we agree on that. Our emphasis should not be first and foremost on the diversity of beliefs (er, opinions) -- not without our "unity premise" already solidly established and emphasized. If I'm not mistaken, that's what you're saying as well. Still thinking about this, I'd say that even our "seven principles" are secondary to that methodology...are products of it. As thoughtful and useful as they are, these too are (as Theodore Parker might have put it) the transients apart from the permanent. Thanks for your thoughtful comments. I appreciate your sharing your thoughts very much. I agree with you if I am understanding your correctly. The 7 principles, while important, could change over time and perhaps deleted and others added. For example, I don't like the way the third principle is stated "acceptance of one another and encouragement to spiritual growth in our congregations". I don't know why the "in our congregations" is in that principle. 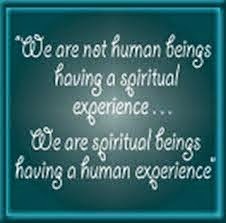 I accept one another a support and encourage spiritual growth more often outside our congregations than within. That little clause seems "anti UU" to me because it indicates an exclusivity that I don't value. Your point, I think, is the idea of the fourth principle which is the free and responsible search for truth and meaning which is the "methodology" and may be the undergirding foundation of our faith which provides the common factor. It is the faith in the search whether it is religious and takes us within and among or outwardly in exploring the external phenonoma of the world through science. I appreciate your distinction you draw here between the principles and the "methodology" that gives rise to them. It is the methodology of our commitment to search rather than revealed "truth" which perhaps makes UU unique among other religions. I have found your comments moving and wonder if you have further thoughts? 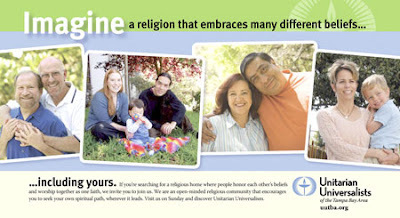 David - if the postcard campaign had said that Unitarian Universalism "embraced all beliefs," then I would have objected. "Many beliefs" is not the same as "all beliefs." Saying that Unitarian Universalism embraced all beliefs would be the akin to saying individual Unitarian Universalists can "believe whatever they want to believe." But "many" is not the same as "all" and that just means that we do have a wide range of beliefs within our congregations. But this wide range doesn't include all beliefs. I agree with your discomfort at the "many beliefs" slogan. A "religion that embraces many beliefs" is a syncretistic and therefore rather artificial approach with no substance, just picking from here and there what we like. UUism needs a more solid message that conveys that you will get something good from going to church, not just meeting different people with different beliefs. That also happens at your workplace after all.